Staffing shortages were highlighted by the CQC as it downgraded an Essex care home to ‘requires improvement’ from ‘good’. 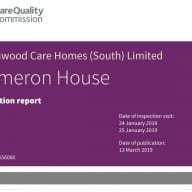 Cameron House in Basildon, which is operated by Larchwood Care, was inspected by the CQC in January. The report added that people were sometimes “at risk of having their safety compromised”, further commenting that some people did not receive their medicines as prescribed. Relatives said there were insufficient staff available to meet people’s needs, particularly if people were unwell or where people became anxious and distressed and staff were needed to respond. Staff agreed that there were not enough of them to provide personal care and comfort in a timely manner. A spokesperson for the home said: “We are understandably disappointed that an effective and caring home has received a less than positive report in some areas. We are, however, very pleased that the CQC identified the home as ‘good’ in two categories, and that many of the comments in the report were incredibly positive. “The team has since put in place a robust action plan to address the comments and has recently been visited by Essex County Council quality assurance team with very positive outcomes. The post Staffing shortages cited as CQC downgrades Essex care home appeared first on Care Home Professional.